Watermelon Sangria: Fresh watermelon and lime juice are mixed up with crisp white wine and seltzer water for a Summer Sangria. Have you ever bought a watermelon too large for your family to eat? Or maybe you purchased one that was just not as sweet as you hoped for? Well, I have been there many, many times. And you all know that I REFUSE to waste food. So just what can you do with excess watermelon? You can make my Watermelon Granita with Mint Lime Sugar, Watermelon Arugula Salad, OR you can make Watermelon Sangria. I guess it just depends on your audience, huh? A classic sangria is beverage made with fruit, wine, seltzer, simple syrup, and an added liquor. This is NOT classic–I know that. Watermelon “Sangria” is a delightful way to use up watermelon. It is fresh and light and bright due to fresh lime juice. And a bit healthier than a traditional sangria thanks to the fact that with watermelon, no simple syrup is needed. Let me tell you, a glass of this sangria with my feet up on my back porch, is a perfect slice of summer! What wine is best to use for Sangrias? Because sangrias are sweetened with fruit, and often simple syrup, they are made with a dry wine. In the case of Watermelon Sangrias, I use a dry white wine. I would pick a wine like Pinot Grigio, Sauvignon Blanc, or a dry Riesling (if it’s dry). I typically use a pinot because that is what I like to have on hand for cooking dishes like Chicken Cordon Bleu. Fresh watermelon and lime juice are mixed up with crisp white wine and seltzer water for a Summer Sangria. Set aside 2 cups diced watermelon. Blend the remaining 7 cups of watermelon until smooth. Strain through mesh strainer to remove any seeds or pulp. 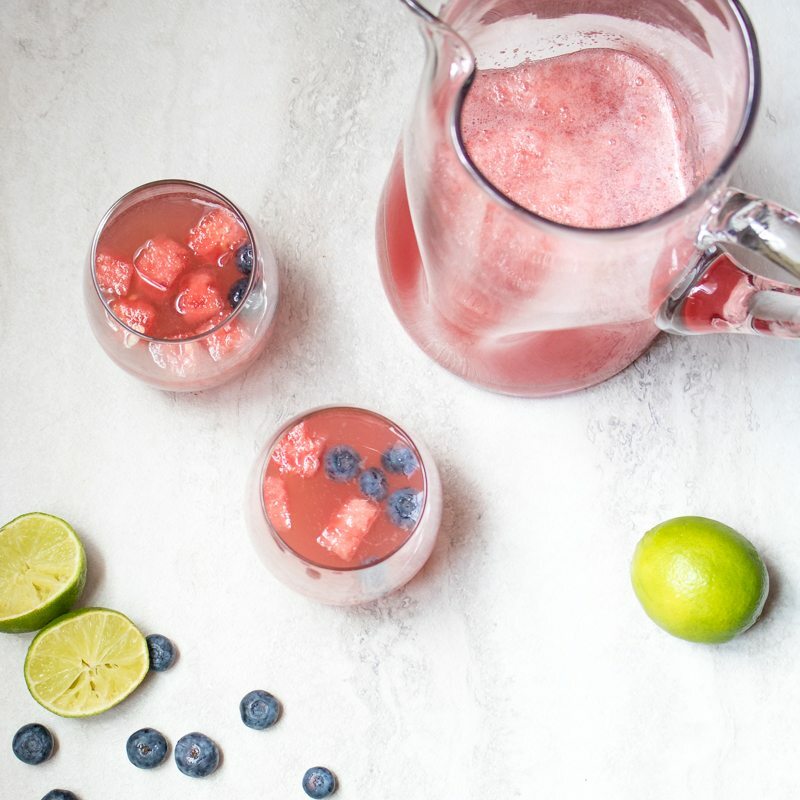 Add reserved 2 cups of watermelon, pint of blueberries, fresh watermelon juice, triple sec if using and wine to large pitcher. Stir to incorporate. Before serving, stir again and then pour in seltzer water. Best to serve after 2-4 hours of refrigeration. Watermelon Sangria will keep for 3 days in refrigerator. Sangria is definitely my go to for summer when I want something light. Your watermelon sangria is so pretty! I’m glad you didn’t use simple syrup. With great, seasonal fruit, it is so not needed. Let the natural flavors shine. I could drink the whole pitcher! It looks and sounds so refreshing. It can be dangerous–so refreshing! LOVE! LOVE! LOVE! Sangria is a fav and this one looks perfect!! That color is absolutely stunning! I’ve used all sorts of fruit in Sangria, but never used melon. I’ll have to change that very soon. Thanks Eileen! Melon is great. And since you blend it you don’t have to wait long for the flavors to blend together. Your non-classic sangria sounds amazing! Perfect for summer!! This looks wonderful! I also want to try that watermelon granita….that sounds perfect for a hot day! I often have more watermelon than I need. Now I know what I can make with it. When watermelon is naturally sweet, it is THE best! Great idea for this drink! Love the idea of fresh watermelon in there – so fresh and summery. Thanks Caroline. Very summery indeed! I am crazy about watermelon everything !! I always have at least 1 watermelon in the house all summer long! Same here! Watermelon is just the perfect summer fruit. You will love this Sam. Love this idea. It sounds so light and refreshing, the perfect cocktail to enjoy on a hot day without feeling like you’re overdoing it. Yes, perfect for a hot day for sure!